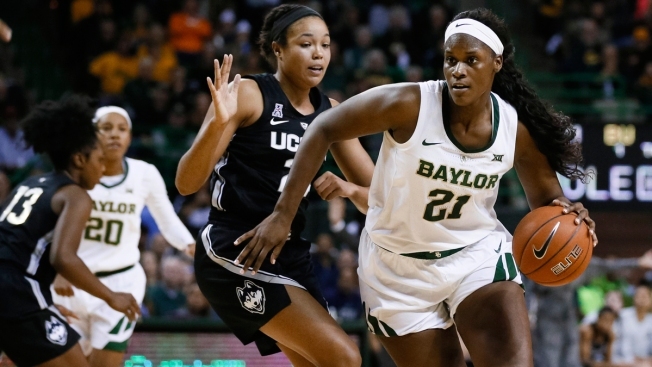 Baylor center Kalani Brown (21) works around Connecticut forward Napheesa Collier during the second half of an NCAA college basketball game Thursday, Jan. 3, 2019, in Waco, Texas. The top-ranked UConn women lost to No. 8 Baylor 68-57 Thursday, ending regular-season winning streak at 126 games. Kalani Brown had 20 points and 17 rebounds as No. 8 Baylor won over a top-ranked team for the first time, beating UConn 68-57 Thursday night and handing the Huskies their first regular-season loss in more than four years. The Huskies (11-1) hadn't lost a regular-season game in regulation since a 76-70 home loss to Baylor in a Nos. 1 vs. 2 matchup on Feb. 18, 2013 -- a span of 163 games. Their only regular-season loss since then was 88-86 in overtime at Stanford on Nov. 14, 2014. They had won 126 consecutive regular-season games, 58 of them non-conference matchups. UConn is the only No. 1 team Baylor has ever faced in coach Kim Mulkey's 19 seasons. The Lady Bears had lost each of the previous three such meetings, including UConn's last visit to Waco nearly five years ago. The Huskies had their only lead at 2-0 when Crystal Dangerfield scored in the opening minute of the game. Chloe Jackson added 13 points, eight assists and seven rebounds for Baylor (10-1), while NaLyssa Smith had 12 points. Juicy Landrum scored 11 points while Lauren Cox added nine points and seven rebounds. Napheesa Collier had 16 points and 11 rebounds for UConn, while Katie Lou Samuelson also had a double-double with 12 points and 11 rebounds. But the two seniors were a combined eight-of-34 shooting. Dangerfield had 11 points and Megan Walker 10. UConn: Geno Auriemma's team was coming off tough wins at Oklahoma and California, and after both games the coach talked about those kinds of games were how the majority of the world lives. This time, they couldn't pull off a late comeback. The Huskies shot only 29 percent (20 of 68) and had their season low in points. Baylor: The Lady Bears have won 28 consecutive home games, and extended their non-conference home winning streak to 45 games since a home loss to UConn on Jan. 13, 2014. UConn, which hasn't lost an American Athletic Conference game in five full seasons in the league, opens conference play Sunday at Houston. Baylor, which last season won its ninth Big 12 title, opens league play Sunday at Texas Tech.